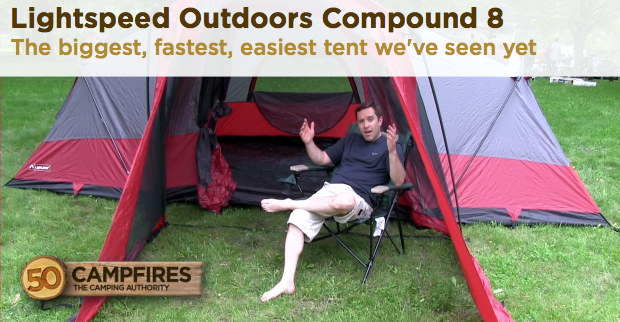 Summary : If you're looking for a spacious family tent that sets up quickly and easily, the Lightspeed Outdoors Compound 8 is hard to beat. compelled to run around in it like a kid. I have to confess, I love big tents. There is something really cool about quickly erecting a structure that big and having it as a base camp all weekend. The Lightspeed Outdoors Compound 8 is awesome in that way. Appearance: Great looking tent. I liked the look of it with the “porch.” It looks like your putting your roots down when you set this thing up. 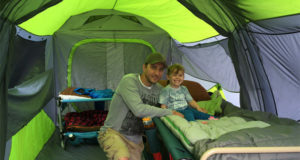 Ease of Use: There are plenty of eight person tents on the market, but none of them set up as easily as the Compound 8. It has the compression hub system, but because the ceiling is almost 7 feet high it also has telescoping poles that help to pop up the main room in a jiffy. Also, there are directions sewn into the case that are well written and easy to follow. One last thing we loved – the case is big enough! Lightspeed does this with all of their gear. That way you don’t have to roll your tent up like a crepe if you want a chance of packing it back in the bag (so annoying). Durability: We found the hub system and the telescoping poles to be quite sturdy. The poles lock on their own and a simple press of the thumb releases them. Weight: No surprise here – the Lightspeed Outdoors Compound 8 is a real beast at 38 lbs. Then again, you’re probably lugging it 10 yards at the most, so not a big deal. 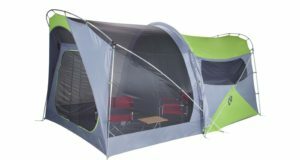 Value: If you research other 8 person tents, you’ll find that it’s competitively priced at $369. When you factor in the ease of use we think it makes for a solid value.